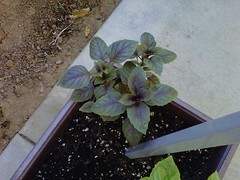 Mmm, purple basil, Jeney used it last night in a sauce..., a photo by billgould on Flickr. She made an incredible gluten free pasta pomodoro with some of this particular variety of purple lemon basil. Maybe we can pester her to post the recipe! Tweet her - @Yenej and let her know!